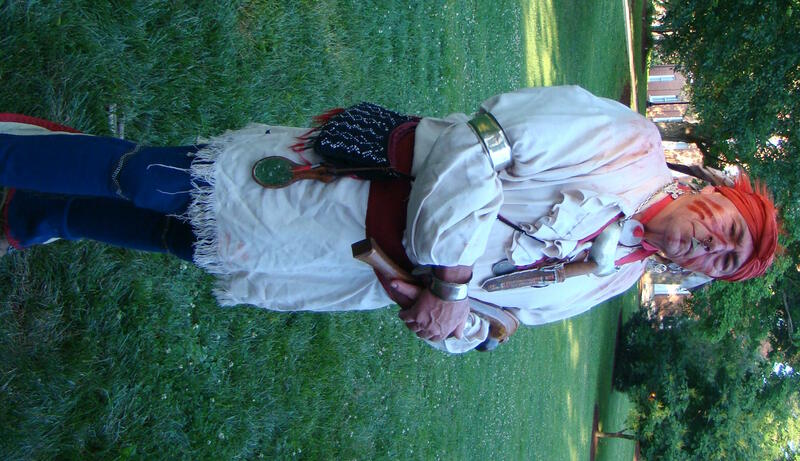 Dressed in buckskin clothes, the appearance of Chief Logan transported the audience back to frontier times. Silver armbands, bracelets, a nose ring and earrings – one a cross- glittered in the sunlight as he took the stage at the Ohio Chautauqua during the 225th Anniversary of Marietta – The Crown Jewel of the Appalachians. Tattoos also adorned his body with a tobacco leaf tattoo on his ear symbolizing “truthful hearing” while a red hawk on his head denoted his tribal connection. John Logan began his life on the Susquehanna River and followed his father’s Jesuit teachings where John’s “sins were washed away”. Friendly with the white settlers, John was always a peacemaker for the Iroquois, who were usually called Mingos when settling in the Ohio Country, and John Logan is most often referred to as Chief of the Mingos. Perhaps his role as peacemaker gave him reason to learn eight different Indian dialects as well as English, French, Dutch and even Latin. However, Chief Logan could neither read nor write. Along the Ohio River, settlers frequently met at the tavern for stories, nourishment and ale. One evening, Logan’s camp along Yellow Creek, near present day Wellsville, Ohio, was invited by a nasty frontiersman, Jacob Greathouse, to a tavern across the Ohio River. During the course of the evening, some of Logan’s family was shot and killed in an ugly massacre. This changed Logan’s peaceful ways in a hurry. In the words of Logan, “It made me want to raise my hatchet that had long been buried and color it with the blood of the English.” Sometime during this period, he walked away from the Christian teachings. While he told the settlers of his anger, he also said the Indians were not all angry…just Logan, as they had killed his people. Known as Logan’s Revenge, he vowed to take ten white man’s scalps for every Indian that had been murdered on the Ohio River that evening. Every time he took a scalp, he made a mark on his hatchet. According to Native American custom, he had a right to this retaliation. The remainder of his life was spent as a kind man who sold deer skins for a dollar each, so he could bury his sorrows in the taverns he visited. In 1781, he was killed by his nephew, because John Logan was no longer considered an asset to his people. Today there is not a drop of Logan’s blood in any living creature. 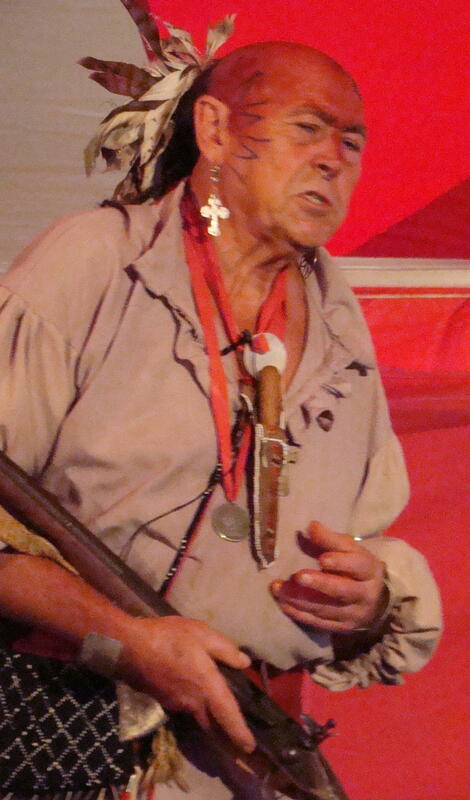 Dan Cutler portrayed Chief Logan with ease as he has spent about a dozen years in that role in West Virginia as well as the Ohio Valley. Frequently he also slips into the roles of The Cornstalk Warrior, Tecumseh and Simon Girty. Dan is currently active in a new outdoor drama, “Drums Along the Mohawk”, which will premier late this summer in New York. 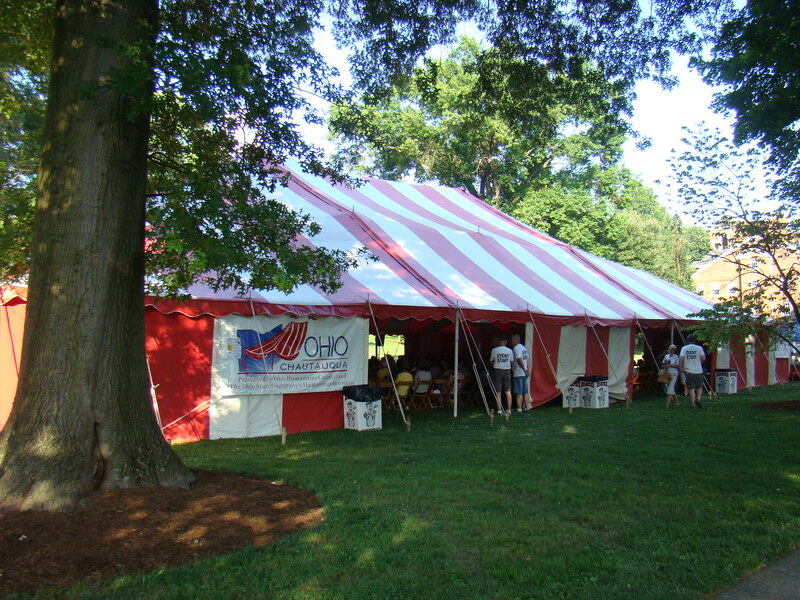 2012 Ohio Chautauqua continues throughout the summer with week long performances and workshops in Gallipolis (July 17-21) and Warren (July 24-28). Hope you find time to join them and learn a little more about “When Ohio Was the Western Frontier”.